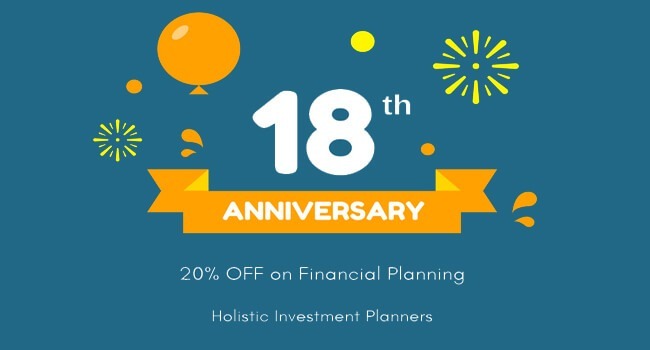 Holistic Investment Planners' 18th Anniversary is on July 5, 2018. On this occasion, we are happy to offer a 20% Discount on our Comprehensive Financial Planning service. We appreciate your interest in personal finance management. We offer 30 minutes financial plan consultation at no cost to our prospective clients. This discussion can be had over phone/via video chat or in person if you are in Chennai. This discussion will help us understand YOU and your REQUIREMENT better. You will also be able to understand about our services. You need to give us a few timings. We will schedule the discussion on any of the timings given by you. We work from Monday to Saturday between 9.30 AM and 6.30 PM. We will be able to tell you the right package (with 20% OFF) for you and the fees to be charged for future services at the end of this discussion. And you need to furnish the following information to have the 30 minutes session. The answers to the below questions will help us in making the 30 minutes discussion more useful to you.